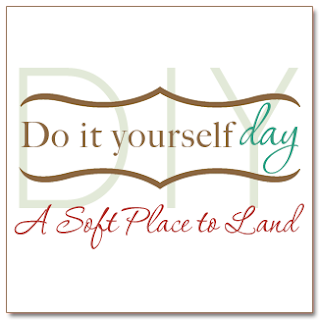 I am joining in on the fun over at Kimba's today for DIY Day. At our previous nest we had extra long windows in the kitchen/breakfast nook. Those windows stayed naked for abt three months after we moved in while I brainstormed on how we could ever afford curtains for in there. One day while walking thru Target I saw some paisley curtains and it dawned on me that I did not have to spend a ton of money on extra long curtains for in there. I could make some store bought curtains into what I wanted instead. These curtains look dark and drab. The tassels are just not my style at all but I knew they could be made beautiful! So they were chopped off and The Nana and I used to valance to make the extra length I needed on the panel. We actually only used three panels and three valances for this project. 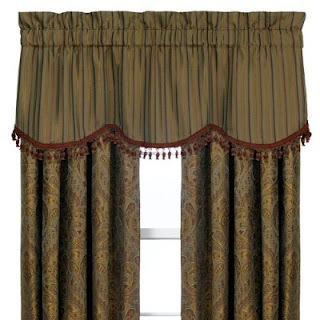 Two panels and two valances were cut in half so that there would not be soo much curtain. The only full panel is the one in the middle. I was pleased but still felt as though something was missing. (Pardon the bad pic. It was the only one I had of the curtains at this stage. Shhh don't tell The Nana!) A year later I stumbled upon The Nester and saw all of her wonderful mistreatment's and another light bulb went off. I ran to HobLob and purchased some gold fab and some trim and created a faux valance with some hot glue, upholstery tacks, and straight pins. No sewing involved this time around. It was just the pop that they needed and I hated that it took a year to finish them off because I just loved them! The faux valance just pulled everything together I think. The paint color was dark so I had to find a curtain that would go but not bring the room even further into darkness. We were not painting in that nest since we knew we would be leaving that nest. It was a bit formal for a breakfast nook but at the time our dining room was our playroom. Sadly these treatments stayed with the home and now looking at them again I think I may run to Target and recreate them for our office in the new home since those windows are extra tall as well! Thanx for stopping by and be sure to head over to Kimbas for more inspiration! I love that window treatment! You're right...that faux valance really DOES make the whole thing POP! LOVE IT! You are so right, those valances make all the difference! You are such a talented young lady. Great transformation!! They look great! About your square pedestal sink...I love pedestal sinks! We recently renovated our two upstairs baths and put in pedestal sinks in both of those rooms. I've considered adding a sink under the rim of each of those...maybe one day I will. Have a good day, Pamela! I thought what you did with the panels was great, but the valance really finished it off nicely! It's so nice to meet you! Thank you very much for entering my giveaway and for following along as well. I really appreciate your kindness. You are always welcome to visit anytime my friend. I love your blog! Your new drapes are just beautiful. Just the type of colors I adore. Kudos to you for making them work for you. Looks outstanding...your valance adds that extra touch! Hope you have a great weekend!